My favorite holiday memories are of having lots of family and friends over for big meals. I love doing the cooking, preparing holiday recipes, the noise and laughter in the house, and of course, eating the food. I've happily adapted most of my old recipes to gluten-free but I had one more challenge.. I was missing crusty chewy Italian bread that I could make into Crostini! I've always loved warm toasted chewy bites of Italian bread at holiday parties. Topped with Tapenade or made into Bruschetta, they are my favorite appetizers, but I hadn't quite found the right gluten free flour blend to achieve that wonderful chewiness, until now! 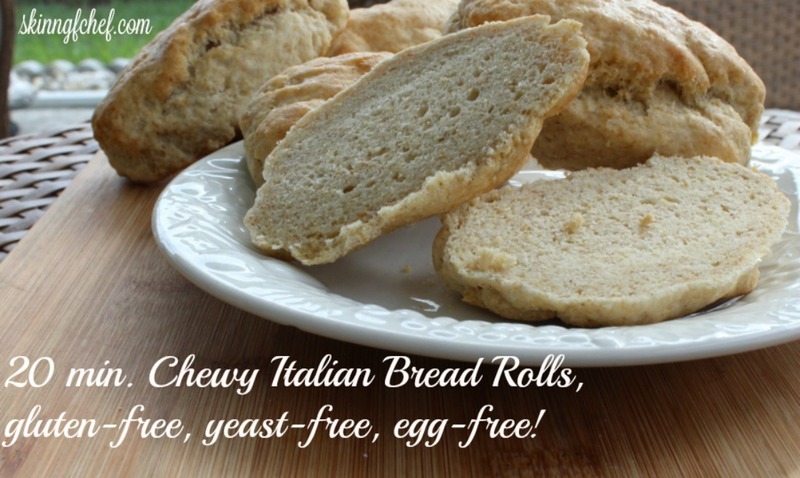 I'm so excited to share my NEW 20 minute Gluten-free, Yeast-free, Egg-Free and Xanthan Gum-Free Italian Bread Rolls with you and did I say, they only takes 20 minutes? No yeast, no rising and so easy to make. This amazing dough is also perfect patted out thin for flatbread or pizza crust. Scroll down to see my new Pizza crust using this awesome recipe. 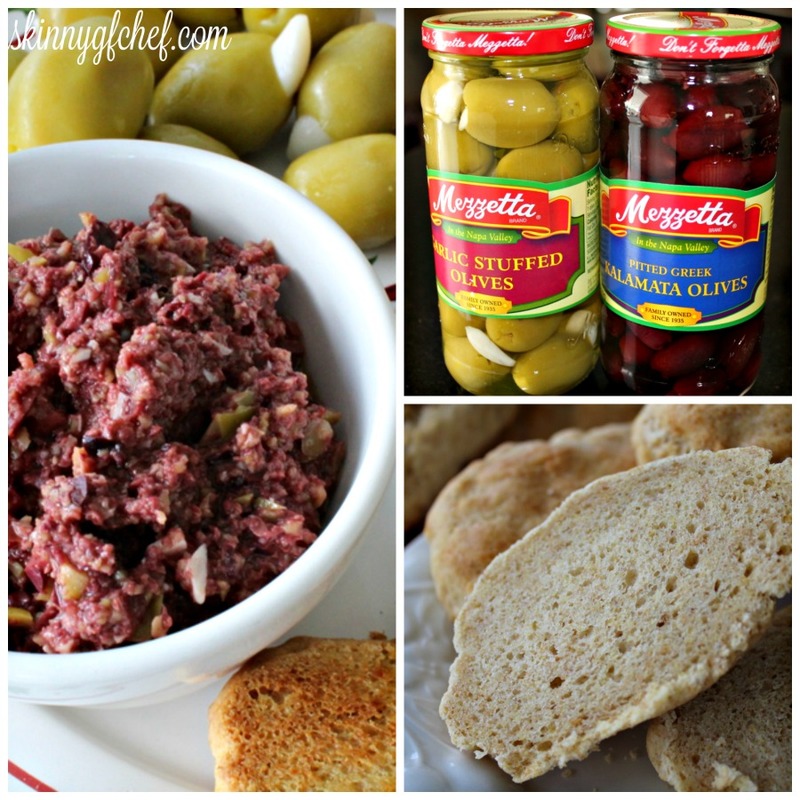 Having Mezzetta's quality products on hand makes my holiday entertaining a breeze. Family owned since 1935, the fourth generation of Mezzetta family is continuing the commitment to bring their customers the highest quality foods available. They source the finest fresh produce from the sun-drenched soils of California, Italy, Spain, France, and Greece and prepare them according to their Italian family recipes at a state-of-the-art production facility in the Napa Valley. My family insists on olives for Thanksgiving. When the girls were little they would put them on each finger and then eat them off. They were so silly and I loved it! We still always have olives on the buffet table, but now that the kids are grown we make some fancy hors d'oeuvres too. I especially like the Mezzetta's sweet Kalamata Olives with their green Garlic Stuffed olives. Typically tapenade is made with capers, but capers are too expensive for me. I like my easier version so much better! You will never miss the capers! Hosting a large gluten-free dinner takes stamina, a sense of humor and flexibility. Make lists! They save my life every year. I list out all of my recipes, ingredients, shopping, and I even list my housekeeping chores. I refer back to the list each day and prioritize what needs to be done. I love when everything is crossed off and I'm good to go! Give yourself credit and don't stress. For Thanksgiving, plan to prepare a few easy appetizers, like my Crostini with Mezzetta Olive Tapenade below, the turkey, gravy, mashed potatoes and gluten-free stuffing, and then ask your guests to bring the sides or salads and their drink of choice. Not everyone will want to make a gluten-free dish. You can have gluten-free and gluten-full sides on your buffet. Just be sure to offer them in separate areas and tag them clearly! Pull out your serving platters and utensils well in advance, decide what foods will go in what dish, and be sure to ask guests to bring their offering in a dish with serving spoon too. Assemble your linens, glassware and flatware, remembering everything does not have to match. I always keep a few jars of Mezzetta Olives and other essentials in the pantry. 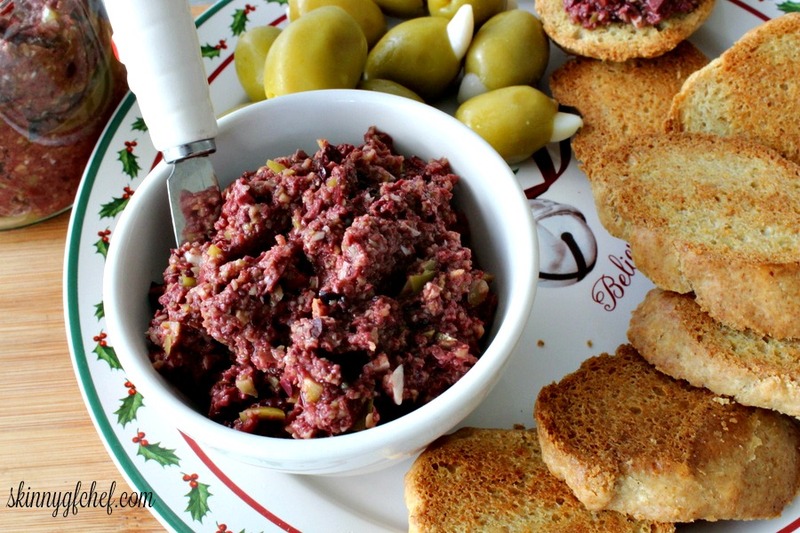 You can make my easy Olive Tapenade recipe below in minutes! It's a life saver if you run out of party snacks or unexpected guests pop in. Most importantly, relax and have fun. If you’re having a good time, everyone else will, too! Instructions: Heat oven to 450 degrees F.
Measure flour mix, baking powder and salt into a large bowl. Cut in butter thoroughly, with fingers or pastry cutter, until mixture looks like meal. Stir in almost all the milk, add vinegar. If dough is not pliable, add just enough of reserved milk to make a soft, easy to handle dough. The dough will thicken on stirring. Flour your hands with a little rice flour. Scoop up a large heaping tablespoon, pat into oblong or rectangle rolls. Place on large baking tray lined with parchment or silpat. Brush on a little of the leftover milk, or to give the rolls a shinier, darker crust, brush them instead with an egg-white wash (1 egg white beaten with 1/4 cup water). For seeded buns, brush the buns with the egg wash prior to sprinkling, as it’ll make the seeds adhere. Bake 12-15 minutes or until golden brown. The rolls need to cool for the best texture. When they are out of the oven they will still be a little gummy. I let mine cool and then store in a tupperware. Brushing the buns after baking with melted butter will give them a soft, light golden crust. Slice the rolls on the diagonal. Start low on one end, angle your knife to the right, cut the end off. Move up, slice at an angle again until you have apx. five 1/2 inch slices per roll. Lay slices on a large baking sheet, brush both sides with olive oil. Bake at 375 degrees F. for 10-12 minutes, turning once. Notes, I used garbanzo bean flour in the flour mix and used the whole 1/2 cup of water. My dough was very thick and sticky like cornbread batter. In a large bowl, whisk together the flour mix and baking powder. In another smaller bowl, whisk the olive oil,1/4 cup of the warm water, egg and apple cider vinegar. Combine the wet ingredients into the dry ingredient bowl. Mix by hand until completely incorporated. The dough should be very thick and sticky. If dry, add more water, a tablespoon at a time. Dump the dough into the center of baking sheet and spread out to desired thickness, using a spatula and a little olive oil. Form a raised crust on the edges. Prebake the crust for 5-10 minutes or just firm to touch. Remove from oven and sprinkle with finely grated Parmesan cheese, like Kraft, to seal the crust. Spread sauce of choice over the Parmesan. Add a cup or more of shredded mozzarella and your desired toppings. Sprinkle with a little more grated Parmesan. Bake for an additional 10-15 minutes or until cheese is melted and crust is done. 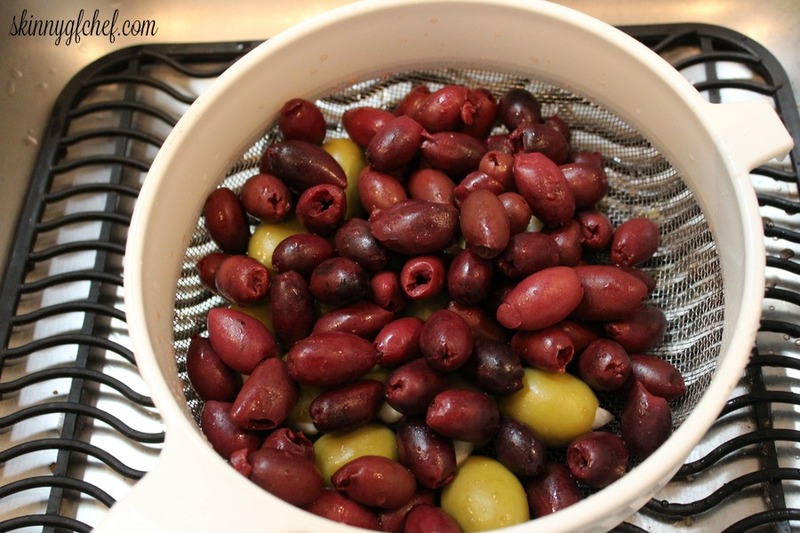 In a food processor, add the drained olives, Dijon and lemon juice. Pulse a few times to combine. Scrape down the sides. Pulse a few more times. Now with machine running, add olive oil in a stream and blend to a chunky paste for apx. 20 seconds. Store in a glass jar in the fridge with a bit of olive oil on top. These look amazing, Ali! You're a genius in the kitchen! Oh hubby and I love the kalamata olive spreads, we always eat this when we're in Greece and we've become addicted. This looks so good. Happy Thanksgiving! This is crazy! I've always wondered how one makes dairy free soy free milk or gluten free yeast free bread! Thanks for giving me a little insight into this gluten free world! I love those olives! This recipe looks so tasty! I would love to try this over the weekend! The bread looks absolutely yummy, I tried gluten free bread and was not really into it I guess it something you need to get used to. I've never met an olive I didn't like. And Mezzetta Olives are my favorite. That bread looks delicious and just looking at it, you would never know it's gluten free. Looks delicious. I could seriously eat that entire bowl of olives. When we were kids we would put them on our fingers and then eat them off one at a time. I'll have to share this post with my friend who has celiac's disease. She's always trying to find new gluten free recipes. Thanks Heather! I know she would love these rolls! It looks really healthy type of bread being glutten free. It also matches with different spreads. It looks healthy and delicious as well. I'm a fan of Italian food. I think Italians have great collection of traditional cuisines. These sound like awesome appetizer recipes indeed for the holiday season.. This is a bread I will have to make for sure because my son is now gluten free. I am always looking for things I can make for him that he will enjoy. Excellent post! My mom is gluten free and she would really benefit from your blog. Not only does this all look healthy but flavorful too. Thanks! Thanks Jennifer, tell your mom that I love chatting about gluten-free cooking and she can find me on Facebook too! This sounds so delicious! I have grown to really love a good tapenade in recent years but I've never made my own. I'll have to try this one! It's refeshing to see such healthy recipes for the holiday season. I'll be keeping your site in mind as I do my own holiday cooking! Mmmm! This post is making me hungry! I have always wanted to try tapenade (huge olive fan) but I haven't had the chance yet. Just made these for dinner, minus the tapenade. Delicious! Good job. :) Thanks so much for sharing them with us at Savoring Saturdays! Hope you had a wonderful Thanksgiving and hope to see you back at the party this weekend! Hi Raia, that is so great to hear and thanks for taking the time to comment!! I'm going to go make another batch today, but this time I think I'll put hot water on the lower shelf and steam them a bit too. It's always fun to experiment! See you at the party! I'm drooling over the bread - not an olive fan, but I hear Mezzetta's products are great! We are big olive fans in our home. We have them at every party/get together! And, that bread looks so good! Can I substitute almond milk or water for the milk in your Italian bread rolls? Absolutely! I use almond milk a lot in many of my recipes, but I would suggest to use a brand that doesn't include sweetener. Looking forward to hearing your results!